BORLA’s custom sound tuning technology delivers the growl level of your choice. 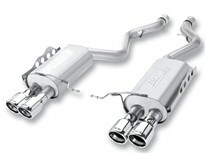 For the M3 Coupe, (PN11771) is a “Touring” Rear Section Exhaust with a mellow rumble, while (PN11764) delivers a more aggressive sound with BORLA’s “S-Type” Rear Section. The M3 Sedan is enhanced by BORLA® (PN11772), a “Touring” Rear Section Exhaust with a bumped up rev and (PN11770), a more aggressive sounding “S-Type” Rear Section Exhaust. All four systems feature BORLA’s famous straight-thru muffler design for added performance; all are constructed of high-quality lightweight austenitic stainless steel for durability, and all boast aggressive looking Dual Split Rear Exhaust Tips. Add BORLA’s race X-Pipe (PN60506) to any of these rear sections to give you that competitive advantage (for off-road use only).